When tactics would pay off? I have been studying tactics for the last month now and my online rating didnt change as i go through tactical exercises daily (30 min - 1 hour). My online rating (correspondence as well as the 15 min. blitz) didn't change until now. Its been stagnant at around 1580-1620 for a couple of months now! when would tactics training actually pay off? or am i missing something here? even though i noticed that some players who used to beat me or i have never won against, i can now win when playing carefully. Re: When tactics would pay off? Tactical exercises are part of a whole, like openings and endgames. Most of the tactical studies are "mate in n" problems, or "gain a piece" problems, and only a few of them involve middlegame strategy. So if you cannot reach a position in middlegame - late middlegame where your tactical training can make the difference, it will be difficult to make progress. Maybe you have to select an opening which is quiet, so you can reach positions more favorable to you. Another thing i suffer from myself, is time management. Are you giving yourself the same amount of time to think in your online games, than you allow in tactical exercises for a single move ? well, i can say that i didnt study openings yet but i play the d4 for white and the sicilian for black and managing to get out of the opening without major disadvantages. I also do endgame exercises and have enough knowledge to win or draw against same strength players. Its true that at some point in the opening after the 8 th move i improvise and not follow any book but i thought thats fine as long as i know what im doing (tactically). As for the time management i usually like online correspondence where i have plenty of time to think eventhough in some games i do play just bcs i want to move (giving 10 minutes of thinking), while i now pay more attention to this habit i try to give myself more time for each move. You have a point there about time management which was my worry in the last month since i only played correspondence chess i figured out that this might affect me in a way that im so relaxed in my games and started to push myself by playing blitz 15 min. per game in order to make a balance in my thinking habit or process, i dont know if you understand what i mean. But now even my blitz rating is not moving forward and almost stuck at some point, and when i analyse some of those games i tend to see that i overlooked some moves or assumed some moves as not good during the game while they turned to be one of the best moves giving myself enough time to think of it, but again since im talking now abt blitz, so during the game im usually worried about the time and could affect my thinking! The trap is that tactics training alone will predispose one to look for tactical solutions where they don't exist. There's a pretty good video on chessfm.com that talks about blitz play that stresses the increased need to rely on technique over calculation for success at blitz. You are at the level where it is increasingly important to develop positional knowledge. The ICS training is great in most cases to develop the positional sense. You might also benefit by reallocating some of your tactics training time to elementary endgame training. Knowing endgame techniques such as shouldering, rook distance, 5th rank cutoff, corresponing squares, etc. etc..... are all hugh shortcuts to calcualtion. Just as you now can quickly spot an X-ray, pin, fork, removal of a guard, etc. the knowledge experience you gain looking at the themes of the endgames will improve your pattern recognition efficiency at that stage of the game. i think endgame training in parallel to tactics is a good idea that im going to try for the next month. Its also true that the ICS material is really great. Im gonna make a study plan mixing those three things together for some time, and see where that would lead me. 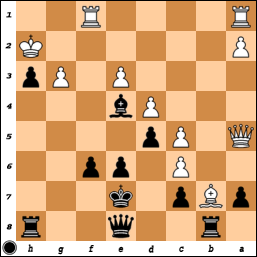 Qxc6 protecting c7 and remove white bishop from 'b' file. The game went easy Qxc6, BxQ, Rb2+, Kg1, h2#, but the hard line i calculated involves Rb2+, Rf2, Rxf2, Kg1, Rg2+ where white interpose its rook to defend (afterall, i gave my queen, he so can give up a rook), anyway the protected h1 square allows pawn promotion (and backrank mate), and my king can escape just in time from Qxc7 & Be8 threats, leading to a longer mate, but mate indeed. while i now pay more attention to this habit i try to give myself more time for each move. You have a point there about time management which was my worry in the last month since i only played correspondence chess i figured out that this might affect me in a way that im so relaxed in my games and started to push myself by playing blitz 15 min. per game in order to make a balance in my thinking habit or process, i dont know if you understand what i mean.